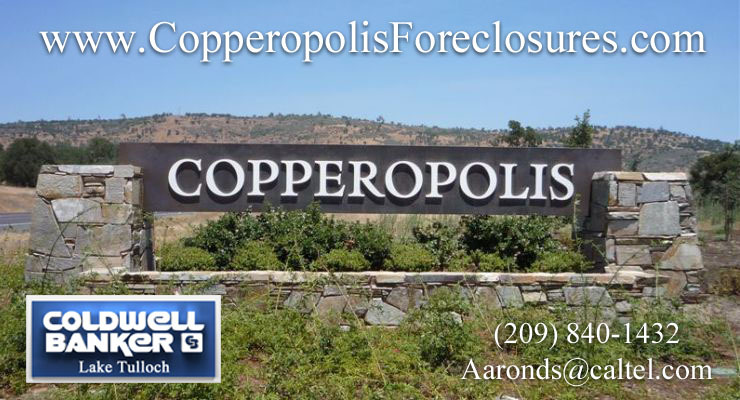 CopperopolisForeclosures.com is the first and only foreclosure specific website specializing in providing information about foreclosures in the Copperopolis, Lake Tulloch and Greater Calaveras Area. We have compiled all of the foreclosures that are listed locally and we would be happy to assist you with any questions that you may have. We also provide real estate services for all of Calaveras County. Learn more about us here. The Copperopolis area is a popular destination as well as a favorite location for second home owners from the Bay Area. In addition to a full line of water activities including great fishing, golf enthusiasts will discover Saddle Creek Golf Club and several others close to the Lake Tulloch/ Copperopolis Greater Area. It is also a great location for the lover of winter sports with Bear Valley and Dodge Ridge ski resorts located close-by.